Start your morning off with a positive and uplifting message of hope and courage. This breast cancer awareness gift will show that you remain strong and steadfast in your quest to help fight for a cure! 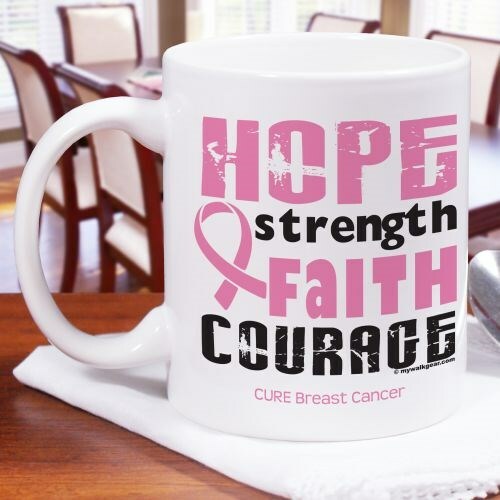 Our Breast Cancer Awareness Coffee Mug is dishwasher safe and holds up to 11 oz. Shop for this mug and other Breast Cancer Gifts to show you care. Enjoy your morning cup of coffee out of this heartfelt and uplifting coffee mug! Get this as a breast cancer awareness gift for your friends, family members, and loved ones who might be fighting the battle with breast cancer. Our Breast Cancer Awareness T-Shirt is another gift option if they're participating in a walk.